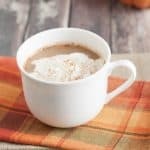 My Homemade All-Natural Pumpkin Spice Latte Creamer is just that—made from all natural-ingredients and can be made ahead and even frozen too! In a medium saucepan, combine maple syrup and bring to a boil. Watch carefully as you do not want it to burn. Once it comes to a boil, turn it down to simmer. Whisk in canned pumpkin, pumpkin pie spice, vanilla and salt. Simmer about 5-10 minutes or until reduced to about 2/3 of original mixture amount. Use immediately in a fresh cup of coffee or cool to room temperature then store in a air tight container in the refrigerator for up to a week. You will want to shake or stir thoroughly the mixture before each use to recombine all ingredients. To freeze, portion out liquid into silicone muffin cup lined pan. About four ounces per cup. Place on a flat baking sheet in freezer and freeze until firm (8-10 hours or overnight). To store, remove from muffin cups and store in a labeled zip top container. Work quickly so creamer "cups" do not melt. Store in freezer until ready to use. You can heat it up to melt or add frozen to your hot cup of coffee and stir to melt and combine.